The above listed item is from the Late Period,(715-332 B.C.E.). 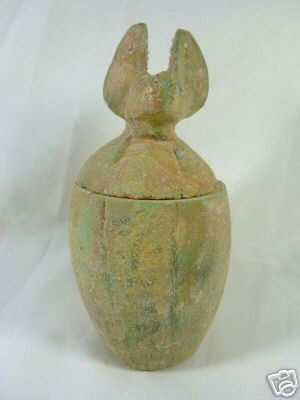 This "Canopic Jar" is clay cast with the head of Anubis, The four sons of Horus protected each Canopic jar. They were Duamutef, a jackal or dog who guarded the stomach, Hapy a baboon, who protected the lungs, Quebehsenuf, a falcon who protected the intestines, and Imsety, a human who guarded the liver. 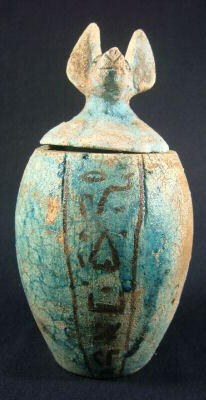 The jar has many hieroglyphics along with a kneeling priest, the gods Khnum, Anubis and a faintly visible cartouche. It is mainly intact and has age wear. The reason for the item being available is due to the vast extent of archeological findings, thousands of years in Egyptian burials and also the proliferation of these said items in older private collections worldwide. 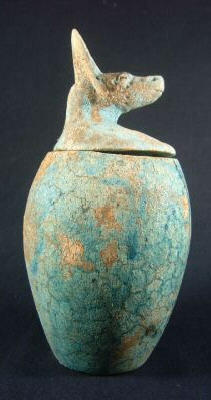 Canopic jars were used during the mummification process. Organs were removed from the body and were placed into four separate jars. The organs were first washed in a wine-like substance for preservation. Each jar was protected by its own deity who were the four son of Horus. Hapy(Baboon) for the lungs, Duamutef(Jackal) for the stomach, Imsety(Human) for the liver and Kebehsenuef(Hawk) for the intestines. In ancient Egypt it was believed, that if you stole a canopic jar and had its contents, you were able to cast evil magical spells. This listed item is of the deity Duamutef who protected the stomach organ. He was depicted as a man or a mummy with a jackal's head and a relative nephew to the god Anubis. Thankfully someone else has already used its contents! 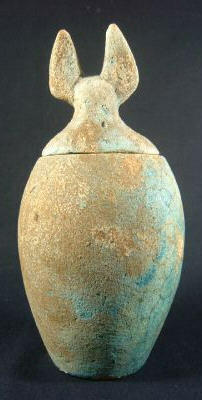 It's intact, made of clay, has some visible hieroglyphics, has some surface age wear and traces of original glaze. A very lovely piece of funerary art. Sold on eBay by seller "H"
This listed item is of the deity Duamutef who protected the stomach organ. He was depicted as a man or a mummy with a jackal's head and a relative nephew to the god Anubis. Thankfully someone else has already used its contents! It's intact, made of clay, has some visible hieroglyphics, has some surface age wear and traces of original glaze. A very lovely piece of funerary art!. We have read this before! See the item from seller "A" above! All of our items come from private collection and from dealers in various parts of the world, these dealers have been working in this business since 1920, We do our best to provide the most accurate dating and time frames on our pieces. we cant guarantee this items exact age.